Rob Cesternino and Akiva Wienerkur aren’t serving any swordfish, but they are bringing you their next recap in the their run through Seinfeld series. 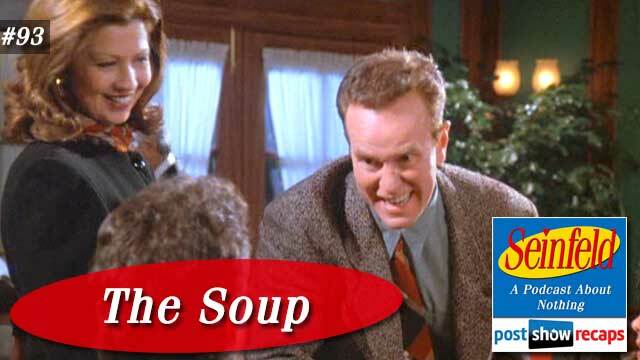 This week, they talk about “The Soup”, which first aired November 10, 1994 as part of season six. The episode was written by Fred Stoller, who also appears as a character later in season seven. And as a special treat, Akiva brings his list of top 25 soups, which starts at 1 hour, 12 minutes and 15 seconds into the podcast. Seinfeld related news – Akiva had an email asking him if Misha would really be distracted by Kramer screaming from the bathroom. Akiva indeed felt this wouldn’t happen, and researched that OJ Simpson himself could have been one to sabotage Misha, since he was at the ’84 Olympics, and in the U.S. in 1994, but Rob didn’t buy this far fetched theory. Rob shared a piece from Seinfeld2000 on Twitter that had Kanye West’s new rap playing over the Seinfeld theme song. Lastly, Akiva shared the tweet of the week from @katerade which said “The most unbelievable thing about Seinfeld is that a comedian has three non-comedian friends”. Jerry’s Story – Jerry runs into a fellow comedian named Kenny Bania who has been working out so much that he offers Jerry a brand new suit that doesn’t fit him anymore. Since Jerry dislikes Bania so much, he doesn’t want to accept it, but everyone else talks him into it. After accepting the suit, Bania throws in how Jerry can take him out to dinner to pay him back for it. Jerry and Bania go to Mendy’s for the dinner, where Bania lauds the swordfish, uttering the famous line, “it’s the best Jerry, the best!”. But Bania only wants soup on this visit, thinking he’ll get his meal another time. At Monk’s Bania joins Jerry and George despite them trying to keep him away. Jerry convinces Bania to order a sandwich, then immediately tells him that this is the meal, though Bania wants it to be from a restaurant like Mendy’s. Jerry is adamant that there’ll be no more dinners. So annoyed by it all, Jerry decides to give Elaine’s boyfriend the suit, right before Bania asks for the suit back. The episode ends with Elaine sending Bania after her boyfriend in the suit. George’s Story – A new waitress at Monk’s named Kelly has been flirting with George, prompting him to ask her out. While out on a walk date, George points out how the word manure is actually a refreshing word, which causes Kelly to share that she has a boyfriend. While discussing the situation later with Jerry, Jerry concludes that Kelly “pulled an audible” after hearing the manure talk, infuriating George. In subsequent visits, Kelly gives George the cold shoulder, leading George to be so uncomfortable, he has to start going to Reggie’s to avoid her. After hearing Kramer got Hildy fired from Reggie’s for calling there too much, he decides to sabotage Kelly the same way so he can start going back to Monk’s. The plan fails miserably when Kelly explains George is Jerry and Elaine’s friend and just trying to get her in trouble. The manager warns Jerry and Elaine that next time George shows up, he’s going to turn him into a hand puppet. Elaine’s Story – Elaine met a man in England named Simon while on a trip there with Mr. Pitt, and she decided to fly him out to stay with her in New York. Shortly into his trip, Elaine realizes he’s rude and mooches off of her, leaving her regretting her decision. By the end of the episode, when Simon is hinting at staying in New York, Elaine effectively ends his stay by sending Bania after Simon to get back the suit. Kramer’s Story – Kramer has decided to get rid of his refrigerator after going through his ordeal with the kidney stones. Added to that, he has started dating a waitress named Hildy, who works at the bizarro diner Reggie’s. Having no food at his house and entertaining an always hungry Hildy, Kramer has to keep raiding Jerry’s for food, since he no longer has a fridge. His relationship with Hildy ultimately ends when he gets her fired for calling into her work too often. Rob and Akiva Tangents – Rob and Akiva discussed how Kelly was actually a character from “The Ex-Boyfriend”, leading them to agree that a Seinfeld trivia between the two could be entertaining. They talked about the merits of having a day date versus a nighttime date, concluding the nighttime date gives a person an easy out based on the time. Akiva tricked Rob into believing that there is a New York City diner employee connection, where they all know each other. Akiva shared how the actual Mendy’s in NYC has ran with the Seinfeld theme by adding certain soups to their menu, but didn’t add swordfish since it’s a kosher restaurant, which infuriated Rob that they would pay fan service to the other menu items mentioned in the episode. What wouldn’t work in 2016 – In 2016, Hildy and Kelly wouldn’t be getting fired for their boyfriend calling work too much, as everyone has their own cell phone. They determined Sanka isn’t that popular now, but does still exist. Also, using frequent flyer miles isn’t as valuable today as it was in 1994. Letter grades and ranking – Akiva and Rob both thought Jerry deserved an A for this episode, feeling it was the strongest story. They gave George a B+, Kramer an incomplete, and disagreed on Elaine’s grade, Akiva giving her a B, while Rob thought it was a C- performance. Akiva thought this was an above average episode, ranking it at 64. Akiva’s Top 25 Soups (at 1:12:15) – Akiva first clarified that no bisques, chowders or stews are counted in this list, and that numbers 25-20 aren’t soups he enjoys, but listed them for context. A few of the soups on the list were Chicken Soup, Matzo Ball, Tomato, Potato, as well as some other classics and a few unique choices. Emails – Johnny De Silveira asked why Elaine was in England with Mr. Pitt. Akiva thought it was a throw away line. He also asked why Hilde is so dependent on Kramer for food, but Rob noted there was no answer to that. Brandon weighed in on George’s bathroom routine from last week. He thought it was worthwhile to take the shirt off to avoid the tail falling in the toilet, and emerging shirtless from the bathroom could tie into being homeless if he were using the sink to wash up. Lindsay pointed out that Hildy isn’t full figured, just loud, to which Rob and Akiva agreed. Lastly, Chester wondered why Jerry gave the suit to Elaine’s boyfriend when he’s so despicable. He also noted that George is banished from Monk’s in this episode, but there was never an issue again in following episodes. Tune in next week as the guys will recap “The Mom and Pop Store” where George will buy a car because actor Jon Voight may have once owned it. Send in your questions by emailing [email protected]. Don’t forget to subscribe to the podcast by going to postshowrecaps.com/seinfeldITunes where you can rate and review the podcast. You can get a discussion going about the podcast by leaving a comment on the show page, and as always, you can follow them on Twitter @robcesternino and @keev26.